Check your water bill to make sure that you are only using water within your water budget. 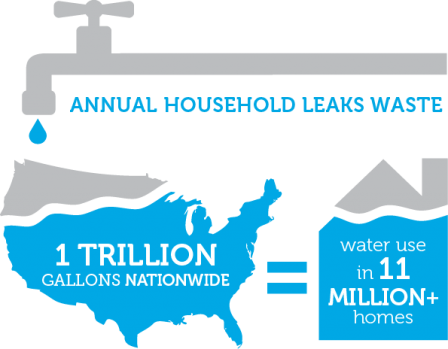 If you are using water in the Excessive (Tier 3) or Wasteful (Tier 4) categories, you will want to check for leaks. Identify toilet leaks by placing a drop of food coloring in the toilet tank. If any color shows up in the bowl after 15 minutes, you have a leak. Be sure to flush immediately after the experiment to avoid staining the tank. For more detailed information, download our How to Read Your Meter fact sheet. If you have an in–ground irrigation system, check it each spring before use to make sure it wasn’t damaged by frost or freezing during the winter. Or, hire an irrigation professional certified by a WaterSense labeled program to inspect it for you. These professionals have passed a certification program focused on water efficiency. They will not only help you detect and correct leaks in the system, but also maximize its efficiency. Finally, check your garden hose for leaks at its connection to the spigot. If it leaks while you run your hose, replace the nylon or rubber hose washer and ensure a tight connection to the spigot using pipe tape and a wrench. A common reason why toilets will leak is an old or worn–out toilet flapper (e.g., valve seal). Flappers are inexpensive rubber parts that can build up minerals or decay over time. Replacing them can be a quick and easy fix for your water woes. To fix this leak, consult your local hardware store, home improvement retailer or licensed plumber. Tip: Bring the old flapper to the hardware store for comparison to make sure you buy a new flapper that fits your toilet model. You can also check the owner’s manual, if you have it, or the manufacturer’s website for the appropriate replacement part number for the flapper. Old and worn faucet washers and gaskets frequently cause leaks in faucets. Many tutorials are available online for how to fix a wide variety of faucets. Tip: Don’t forget to turn off the water line before you start! Some leaky shower heads can be fixed by making sure there is a tight connection between the shower head and the pipe stem and by using pipe tape to secure it. Pipe tape, also called Teflon tape, is available at most hardware stores, is easy to apply, and can help tame unruly leaks. For more complicated valve leaks in showers that drip when not in use, contact an experienced handyman or licensed plumber. Tip: It’s also a good idea to check and, if needed, replace the washer or “o” ring inside the shower head while making this repair. Have you done all that you can to try to eliminate leaks from your home but still can’t nip that drip in the bud? If you’ve already determined you have leaks and you find these step-by-step solutions aren’t enough to stop them, it might be time to replace your leaking fixtures indoors and/or retrofit your outdoor irrigation system. If you consult with a plumbing professional, and look for the WaterSense label when considering a new toilet, faucet, shower head or irrigation device(s), you could increase your water efficiency to save money – and precious water resources – for the long-term!